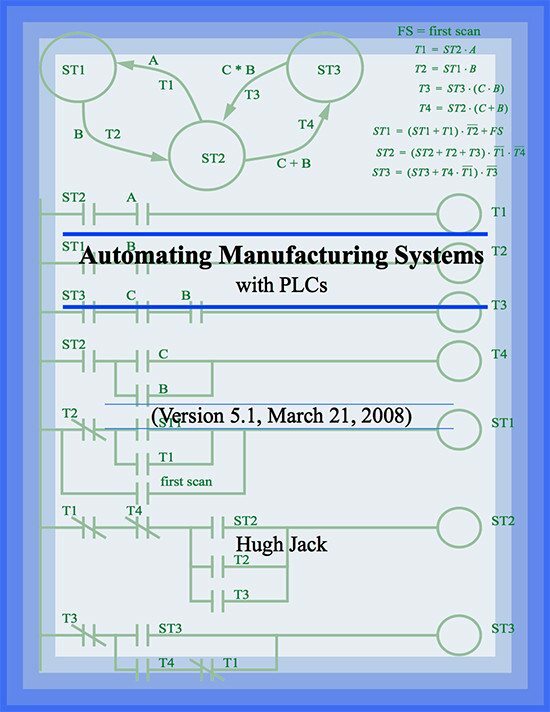 Many PLCs and their configurations are available, even from a single vendor. But, in each of these there are common components and concepts. Power Supply – This can be built into the PLC or be an external unit. Common voltage levels required by the PLC (with and without the power supply) are 24Vdc, 120Vac, 220Vac. CPU (Central Processing Unit) – This is a computer where ladder logic is stored and processed. I/O (Input/Output) – A number of input/output terminals must be provided so that the PLC can monitor the process and initiate actions. Indicator lights – These indicate the status of the PLC including power on, program running, and a fault. These are essential when diagnosing problems. Rack PLC– A rack is often large (up to 18” by 30” by 10”) and can hold multiple cards. 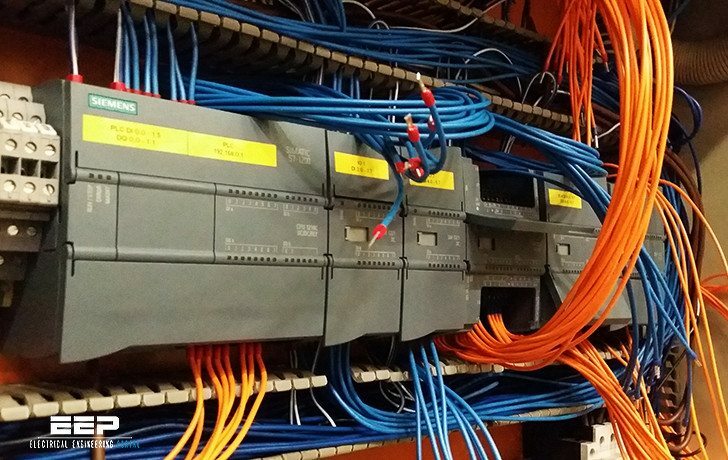 When necessary, multiple racks can be connected together. These tend to be the highest cost, but also the most flexible and easy to maintain. Mini PLC – These are smaller than full sized PLC racks, but can have the same IO capacity. Micro PLC – These units can be as small as a deck of cards. They tend to have fixed quantities of I/O and limited abilities, but costs will be the lowest. 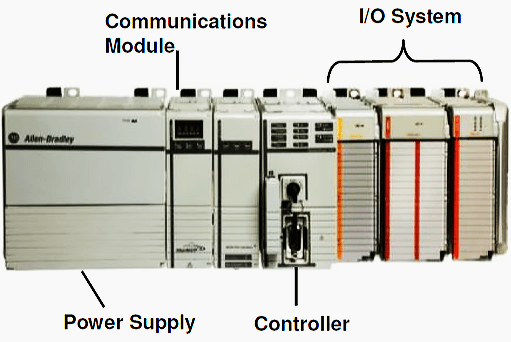 Software – A software based PLC requires a computer with an interface card, but allows the PLC to be connected to sensors and other PLCs across a network. Inputs to, and outputs from, a PLC are necessary to monitor and control a process. Both inputs and outputs can be categorized into two basic types: logical or continuous. Consider the example of a light bulb. If it can only be turned on or off, it is logical control. If the light can be dimmed to different levels, it is continuous. Continuous values seem more intuitive, but logical values are preferred because they allow more certainty, and simplify control. As a result most controls applications (and PLCs) use logical inputs and outputs for most applications. Hence, we will discuss logical I/O and leave continuous I/O for later. Outputs to actuators allow a PLC to cause something to happen in a process. A short list of popular actuators is given below in order of relative popularity. Solenoid Valves – logical outputs that can switch a hydraulic or pneumatic flow. Lights – logical outputs that can often be powered directly from PLC output boards. Motor Starters – motors often draw a large amount of current when started, so they require motor starters, which are basically large relays. Servo Motors – a continuous output from the PLC can command a variable speed or position. Outputs from PLCs are often relays, but they can also be solid state electronics such as transistors for DC outputs or Triacs for AC outputs. Continuous outputs require special output cards with digital to analog converters. Inputs come from sensors that translate physical phenomena into electrical signals. Typical examples of sensors are listed below in relative order of popularity. Proximity Switches – use inductance, capacitance or light to detect an object logically. Switches – mechanical mechanisms will open or close electrical contacts for a log- ical signal. Potentiometer – measures angular positions continuously, using resistance. LVDT (linear variable differential transformer) – measures linear displacement continuously using magnetic coupling. 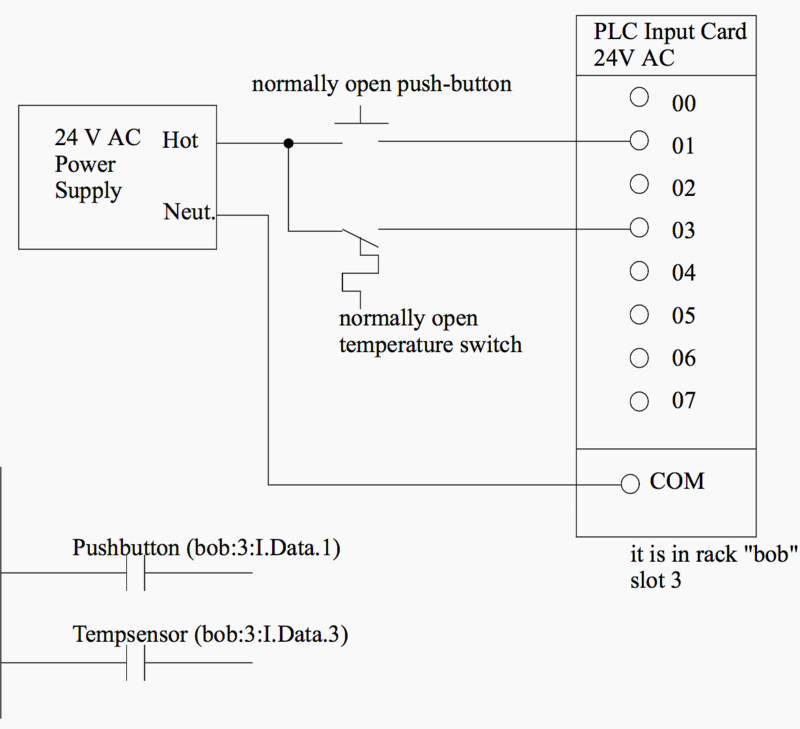 Inputs for a PLC come in a few basic varieties, the simplest are AC and DC inputs. Sourcing and sinking inputs are also popular. This output method dictates that a device does not supply any power. Instead, the device only switches current on or off, like a simple switch. Sinking – When active the output allows current to flow to a common ground. This is best selected when different voltages are supplied. Sourcing – When active, current flows from a supply, through the output device and to ground. This method is best used when all devices use a single supply voltage. This is also referred to as NPN (sinking) and PNP (sourcing). PNP is more popular. This will be covered in detail in the chapter on sensors.